My Child is Sick or Has an Accident at School. What Happens? Except in cases of emergency, students who become ill or who have suffered a minor injury at school will be cared for at the school. Parents will be contacted when illness/injury necessitates the student to miss class or when medical attention is required. Where there is an immediate concern for a student's health, the school will summon an ambulance or take the student immediately to the hospital. In emergency cases only, parents will be contacted while the student is transported to the hospital. Each year, students will be asked to provide the office with updated health information, including name(s) of doctor(s), dentist(s), and any health concerns (e.g. allergies). Medications are not administered to students by school staff, unless a health protocol has been determined. Members of school athletic teams are advised to have a routine medical examination at the start of each season. Coaches or administrators may require a medical examination prior to participation. ​If a student is ill and needs to sign out, the Office will contact the parents/guardians for students in Grades 9/10. If the student is feeling ill, he/she will be directed to the Medical Room for temporary respite until a parent/guardian is able to arrive and take the student home. What is LVR's Attendance Policy? LVR encourages regular attendance and punctuality for all students. Attendance is taken electronically and posted to the Office on a daily basis. Students who are late or must leave school for a valid reason (medical, dental, family, field trip, extra-curricular, community event, or personal illness ) must provide a note to the Office or receive approval from Administration. 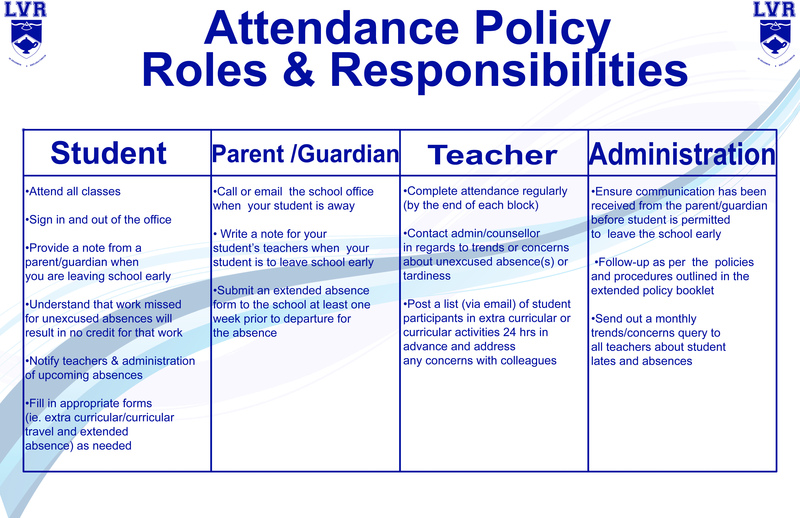 If a student is absent without an excused reason, an email is generated and sent home to parents/guardians. Students who do not attend may be at risk of losing their seat in a face to face course, or may risk Graduation if course learning outcomes aren't met. Teachers will contact parents if there is an issue; school Administration will follow up if there is a persistent problem, including putting a plan in place for attendance, or an alternative learning program. What Documentation is Required for Registration for LVR? Students (and their families) who are new to SD8 Kootenay Lake School District or who have moved into the LVR Catchment Area by Spring Break are welcome to register at any time by coming in to the school and speaking with the Principal or one of the Vice-Principals. You will fill out a registration form, and provide identification (birth certificate OR passport, Care Card, and proof of residency). Out of country registrants will need to provide proof of Landed Immigrant status. With the exception of hockey players and independent students, students are expected to be living with a legal guardian in a (permanent) residence within the LVR Catchment Area. We are out of District or Out of LVR's Catchment Area, and Wish to Register for next Year. What Next? Students and their families who are transferring to LVR from another in-District public school for the upcoming school year are considered Cross-Boundary Transfers. Therefore, they must complete a Transfer Form ​and Registration Form (for current information) to be submitted to LVR between March 1st and March 31st. Both forms will be forwarded by LVR to the Board Office for approval by the end of the deadline day. Incomplete forms or applications received after March 31st will remain on the transfer list until the end of the first week of September until space is determined for courses and an academic program. Please not that every effort will be made to provide students with an educational program. Students who are at DESK, homeschooling, St. Joe's, Waldorf, Self-Design, Ecole St Alpins,or Wildflower must complete and submit a transfer form by the March 31st deadline. ​What is the School Fees Policy? The variety of elective courses have fees, so we can offer students the opportunity to enhance their learning experience. The General Student Fee is also required for the school to be able to organize events for all students, provide locks and lockers, provide access to photocopiers, printers and computer networks, the student telephone, cultural performances, guest speakers, etc. All relevant school fees must be paid before the end of September for first semester, and before the end of February for second semester. Students may not be permitted to participate in activities, or use materials necessary for classes such as art, mechanics, woodwork, etc. if fees are not paid. The supplies for elective courses are very costly, and would not be able to run without student fees. There may also be fees associated with extra-curricular activities such as sports teams, course related field trips, PE activities, etc. There is an expectation these fees are payable by the deadline given by the teacher. Families who are currently experiencing financial challenges may contact the school Principal to arrange for deferred/staggered payments or a waiving of fees. ​Can my Child Ride as a Guest on a Bus? Parents/guardians must advise school in written form or by telephone when requesting a bus pass for their child. LVR will issue bus passes only to students registered at our school. A guest rider is any person who is not a regular registered bus student on the bus on which they are riding. Bus drivers have the right to refuse guest riders if the bus is over capacity, or if there is a safety and/or discipline concern. Please note that instruments or skateboards may only be carried onto the bus if they are safely stored in a bag or a pack. ​Families whose children live out of the LVR catchment area are responsible for their own transportation. ​What is the School's Digital Device Policy? LVR recognizes that digital network access is becoming increasingly important for access to digital resources and collaboration. Currently, LVR is in the process of developing a standard school wide digital device policy that will promote equity, address safety and learning concerns, and provide flexibility for learning and social use. At this time, it is at the teacher's discretion whether digital devices, including cellphones, tablets, and laptops are permitted, unless the student has an IEP that requires the support of a device. ​Students who register with LVR must complete an SD8 Network Use Agreement outlining digital network protocols, guidelines, and consequences. ​How does LVR Handle Discipline? LVR's Code of Conduct outlines the guidelines in detail. Students can expect fair and consistent consequences which are preventative and restorative rather than merely punitive. When practical, student input should be considered in the determination of consequences. Consequences should take into consideration the severity of the offence. Special considerations may apply to students with special needs or circumstances. In most cases, where a contravention of the Code of Conduct has been determined and consequences are being administered, the parent/guardian of offender will be notified. Officials and outside agencies will be notified as required by law. Every effort will be made for a restorative approach; in some cases, alternative programming to support student needs will be a consideration including: partial attendance, temporary withdrawal from school for a distributed learning program, or our REACH alternative education campus. ​Who do I Contact if I am Dissatisfied with How an Issue has been Handled? LVR promotes proactive, respectful, and timely communication between parents and staff. The first step in resolving any issue is to begin with the staff member with whom an issue has arisen. Respectful communication is the first step in resolving issues. If there is an inability to do so, then parents or students should speak to one of the Vice-Principals or the Principal. See the attached SD8 Communication Protocol for clarification of the process. ​For broader decisions based on student educational programming, graduation, or disciplinary matters, see the SD8 Appeal Bylaw link below. ​Our Family is Taking an Extended Vacation During the School Year. What Happens? LV Rogers Secondary discourages students taking vacations during school time or leaving school prior to the normal closing date. Students missing classes lose essential instruction and place increased demands on classroom teachers in the areas of record keeping, administering make-up work, particularly in academic courses. During the planning for an absence, parents and students should understand that teachers cannot possibly, in all cases, pre-teach the lessons, nor provide make-up assignments to cover all the material that will be missed. Parents are strongly encouraged to contact the Office well ahead of the planned family travel, and to complete the Extended Absence Form below. Extended absences may range from 2 weeks to 3 months or so. In the case of an extended absence of 3 months, students may be withdrawn from courses and enrolled in distributed learning courses through DESK or another service provider.